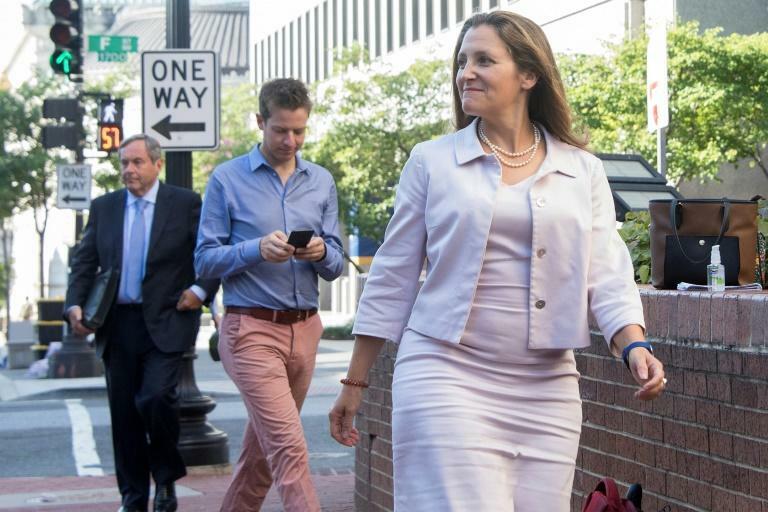 With Friday's deadline fast approaching, Canada's Foreign Minister Chrystia Freeland remains optimistic she can reach a deal with the US on an overhaul of the North American Free Trade Agreement. After three days of negotiations with US Trade Representative Robert Lighthizer, Freeland told reporters Thursday night that the sides are "making progress." "We covered a lot of ground." The White House plans to notify Congress on Friday of its intention to enter into a new free trade agreement, to provide the required 90 days' notice that would allow NAFTA 2.0 to be signed by December 1, when Mexico will install a new president. Freeland said officials will continue discussions late into the night, as they have done throughout the week to try to bridge differences to preserve the three-nation trade pact. President Donald Trump has threatened to leave Canada on the sidelines since announcing a breakthrough with Mexico on Monday, but the US president and Canadian Prime Minister Justin Trudeau both have expressed optimism a deal is close. "We are replacing NAFTA with a beautiful, brand-new US-Mexico trade deal," Trump told a crowd in Evansville, Indiana. And on Canada, "I think it is going to happened and we really have developed a really good relationship. But they have to treat us fairly. They haven't treated us fairly." But officials will need to find compromises on issues that have created friction between the neighboring countries, notably Canada's dairy trade rules and mechanisms to settle disputes and intellectual property protections. Freeland has declined to comment on the specific issues being discussed, saying officials had agreed "we are not going to conduct our negotiation in public." Negotiators have worked for a year to update and rewrite the 25-year-old free trade pact, but have rushed in the past six weeks to get it past the goal line. If the White House notifies Congress by Friday, it then would have until September 30 to submit the final NAFTA agreement, but the sides will have to have the major points ironed out. Even if the pact is signed by December 1, US lawmakers would have time to debate before voting on it, and that is unlikely to happen until a new Congress begins next year following midterm elections in November. The sticking points between Ottawa and Washington center on Canada's managed dairy market -- something Trump has criticized frequently -- and how to handle some disputes among NAFTA partners, as well as patent protections for medicines. Trudeau has vowed not to give in to Washington's demands to alter the system under which Ottawa sets dairy production quotas and prices, with steep tariffs on imports. Freeland said she had remained in close touch with her Mexican and US counterparts throughout the summer and had already achieved "a high-level agreement with the US" on some of the pending issues on autos and labor rights. She also has met this week with her Mexican counterparts, who remained in Washington after announcing the breakthrough deal with the United States. Mexico's Economy Minister Ildefonso Guajardo said he expected to rejoin his US and Canadian counterparts for trilateral talks. 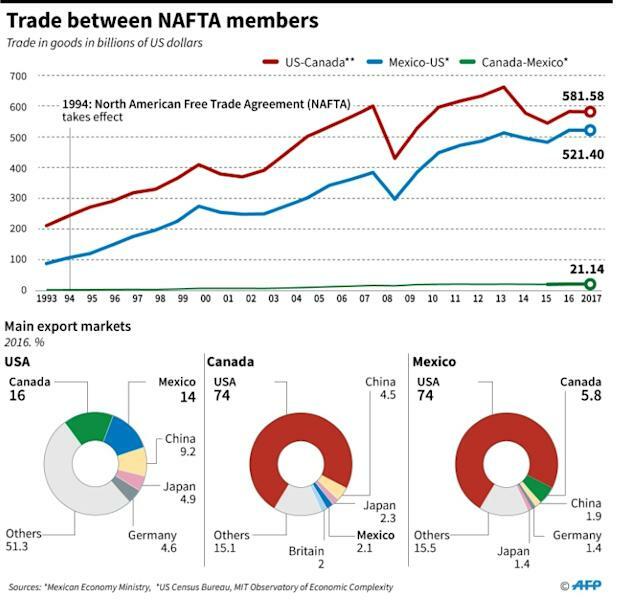 The new NAFTA includes a higher percentage of locally-produced components in autos, a requirement that a percentage of vehicles must come from high wage factories, tougher worker protections and a provision to review the 16-year deal every six years.